The products and features that defined 2015. Thanks to the support from thousands of ACI appraisers across the USA, 2015 was a noteworthy year. 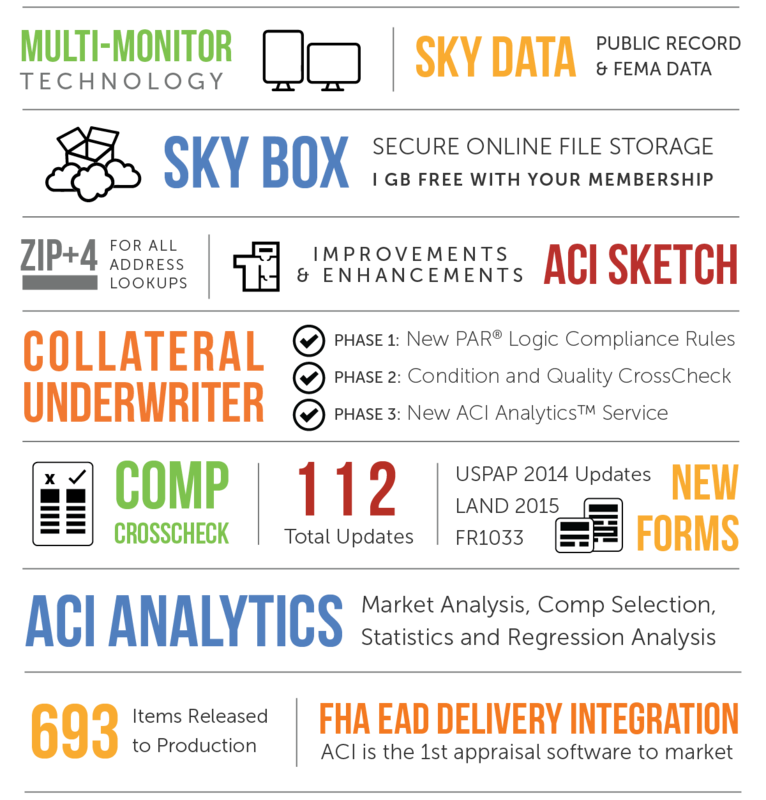 Together we jumped ahead and ACI is now leading the way with new innovations including: compliance rules, FHA EAD delivery, statistical analysis, comp selection, web-based reporting, and an appraisal review platform. We love to be challenged and we encourage you to keep sending us your ideas in 2016. Stay tuned – we’re just getting started! Here’s a few of our more notable 2015 highlights. Finally, it wouldn’t be a 2015 wrap-up if we didn’t talk ACI Sky™. Everywhere we go, people want to know, who we are, so we tell them, we are the Sky guys, the mighty, mighty… you know the cheer. The flexibility, convenience, and power of the cloud is more evident every day. Want to catch the next flight to get started with Sky? We’re on-boarding 100 clients at a time, so fill out this brief questionnaire to get in line.